The simmering feud between Damien Hirst and Charles Saatchi, the two circus masters of Britart, has ended in a truce, with the reclusive collector selling nearly a third of his holdings of early Hirsts back to the artist. Hirst, whose wealth tops £35m after making £11m from his last London show at White Cube, bought back 12 works for an undisclosed sum through his dealer, Jay Jopling. 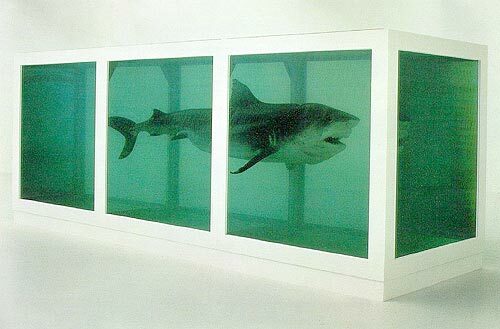 Saatchi, however, has held on to several of Hirst’s best-known works, including his pickled shark, cows and sheep. There was speculation last night that Hirst had reclaimed arguably his most powerful work, A Thousand Years, a rotting cow’s head on which flies hatch only to perish moments later on an electric trap, which had some delicate souls retching when it was first shown at the Royal Academy. The installation has been missing from the Saatchi gallery since September, as has One Little Piggy Went to Market, another example of Hirst’s taste for the grotesque. Both men rose together in the early 1990s after Saatchi met the young tyro at the Freeze, the epoch-setting show Hirst curated in east London, and the advertising tycoon began buying his work. But the tricky question of who “made” whom has dogged their relations for years. The relationship reached a nadir last year when Hirst, angry at the way his work was shown in a warren of former municipal committee rooms at Saatchi’s new gallery in County Hall on the South Bank in London, refused to have any part in a retrospective. To further register his displeasure, he excised all mention of the show from his CV.